Ha-ha! My hubby did that once upon a time as well! Almost the exact same scenario, he walked away from the grill for just a few minutes (literally) and when he went back to give the chicken a flip he found charcoal. Dinner that night became broasted chicken purchased from the grocery store. That has to have been at least ten years ago now, and we still talk about it often. Just yesterday, actually, he went out to cook something on the grill and on his way out the door my exact words were “don’t burn it”. He seldom walks away from the grill now. Bless your heart!! Things are just like that at times for all of us. Thanks for that post. I can literally relate on every level having been on the burned end of a chicken dinner myself. It may have happened with bratwurst as well. I have to say it made me laugh which is totally welcome on this Monday morning at work :) I always step back when things like that happen…really unexplainable…and thank Jesus for saving me from something?? Who knows, maybe the chicken was bad?? I can certainly relate to that! Just the other day I put all of my first picking of asparagus into a steamer on the stove, turned it up and got side tracked until I noticed an awful burning smell. The water burned out and the pan was black. I couldn’t sleep that night because I couldn’t get the smell out of the house! OOPSY! I scorched the chicken. Thank you for all your wonderful posts. This one hit me at the end of your post because it’s been a rough day. When you mentioned “Truth tell me that I’m rocking this job even when I don’t, because Christ’s power is made perfect in my weakness.” It’s encouraging because even when I struggle I’m still the one that God chose as mom to my children. And even when I blow it there’s better days. Thank you for blogging so that you can spend time encouraging us mom’s that need it. Bless you for sharing so honestly! It happens to all of us, and I personally get upset any time I do something that wastes food. When we don’t eat the leftovers soon enough (even though we do about 95% of the time), I HATE throwing out food so much that I tend to feel badly and judge myself too harshly. We sure do need that grace! Oh no! Mitch did something similar with some riblets we got on sale recently. He’d made an amazing dry rub and sauce for them. He was quite upset. They tasted good underneath the burned layer . . . ;) It is discouraging though because meat is so expensive! The risk of grills! I love this video series fyi–so good! 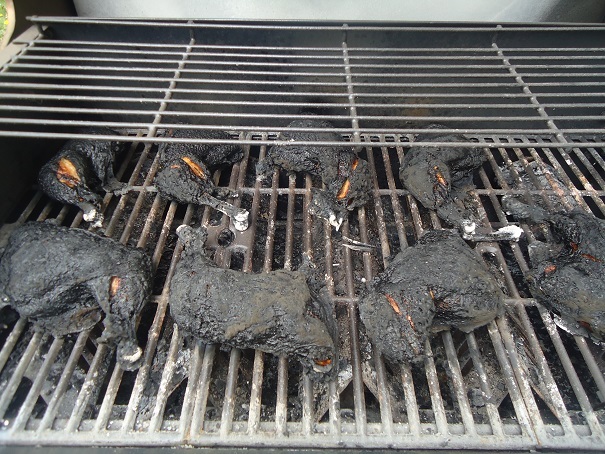 That looks like my chicken every time I grill! I have a real knack for melting grills! And I’ve had some of those finest moments too. Ruining food brings out the worst in me!